When I was growing up in Alabama, our family would spend a week each summer exploring The Great Smoky Mountains. As a result of these trips, I developed a love for The Smokies that has only grown stronger with the passage of time. On a visit to the mountains in the mid 1980's with Lynda and the kids, I played a cassette tape of Aaron Copland's "Appalachian Spring" while we drove through the National Park. The music was so satisfying, I began to develop the idea of recording an album designed to enhance the mountain experience and perhaps enable you to revisit mountain memories long after your return home. Approximately two years ago, I was given the opportunity to record a few tunes for the film that is presented daily at The Park's Sugarlands Visitor Center near Gatlinburg. With the encouragement of Sonny Hutchinson (the film's producer) and Kent Cave (of the Nat'l Park Service) I decided to revive this "driving through The Smokies" musical project. Presented here are the tunes I did for the film plus other traditional folk songs, old-time fiddle tunes, and the haunting sounds of 18th and 19th century Gospel melodies that have been played and sung by many generations of mountain people. 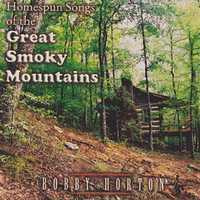 Also contained are some songs I composed as I revived some of my own mountain memories. In this album, I created these arrangements, played all the instruments, sang all the vocals (with the exception of my daughter Rachel "oooh-ing" in the opening piece), and I recorded each song in the production studio here in my home -- hence the "Homespun" in the title. I hope these tunes will enrich your trip to the Smokies and/or enable you to revisit your own mountain memories long after your return home.